As much as I love playing dressing up, there's nothing quite as alluring as a simple black and white outfit. Especially one that involves a white button down and black trousers (or some variation of it). It's smart, sophisticated and never outdated. In this case, my white button down involves a luxurious silky designer shirt with a playful cape detail and some skin tight leather leggings. A classic black and white uniform provides the perfect backdrop to showcase my latest shoe obsession, these metallic silver sandals. I love the slight hint of skin they lend to an otherwise covered up outfit. Finishing off with a dash of colour on the lips, a structured tote to offset the flowy shirt, and a bright white mani/pedi. Simple as it may be, I think I've just found my new favourite outfit. That just goes to show, they don't call them classics for nothing. Totally agree with you , I have posted recently similar outfit ! You look stunning Jenee! And I have such admiration for you to wear silver open toed sandals in the rainy season! Love black and white on you!! I'd have to agree completely, this is so chic and the details make it so interesting.... The cape detail on the blouse is just gorgeous!!!! Ps thank you sooo much for saying you could relate my style to ADR, she is my icon and it literally made my day!!! I love the interesting shape of this shirt. You look gorgeous, as usual! love this look on you! the minimal is so chic! xO! Love the simplicity of all the items. All put together, they create a lovely ensemble ! I love a simple B&W outfit! All the way down to the nails. LOVE your leggings!! You look amazing in them and I wish I had slender legs to wear skin tight like that. :( You look so pretty! You look stunning as always!! Love the clothes that you're wearing. 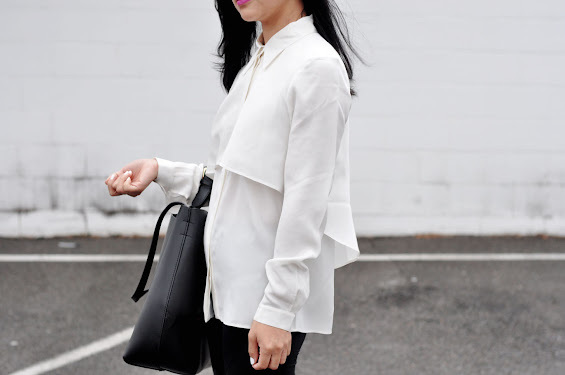 You really can't go wrong with a simple white button-front! Yours is very pretty with the drape- and those shoes! I definitely agree with you that you can never go wrong with b+w. You look so, so AMAZING! That blouse is gorgeous and I am seriously lusting after it. Why do I want everything you wear???? Fabulous classic outfit. I need to get some leather pants. I am obsessed with this outfit. Love everything about it! Especially those heels!! Wide heels are going to be big this Spring. Black and white is so classic...I love it! The cape detail on your blouse is so cool. I agree it's a classic look. I love black and white together too. This is a fantastic clean-chic outfit. I am very impressed! I love black and white together, so classic. You look so incredibly chic and gorgeous. Those shoes are stunning. And I love the purpley lip color! Wow, you look incredibly chic! I just LOVE the cut of your top and the flowiness! Love every peace of it! First off all the blacknwhite combo, second that gorgeous tibi shirt en third those spectacular heels!! I can see why this is your favorite outfit. It's chic and looks so comfortable too. Happy New Year, Jenee!! hey jenee! black & white always looks sleek and sophisticated. i am loving this outfit! great top, leggings and you have the best shoes. Great minds think alike. I have my take on the classics too. I love this look minimal but with great impact. One of my fav on you hot mama. I love your Style so much!!!! black and white is my favorite combination! Always stylish and elegant! Hooow beautiful! Love your blog! It's so stylish! Great outfit! so simple yet so elegant. loving the leggings in particular, think I have to add them to my shopping list! Perfection! Proof that although complicated layers are fun (and necessary) sometimes, they are not required to look chic and sophisticated. I really love this simple black and white combination.